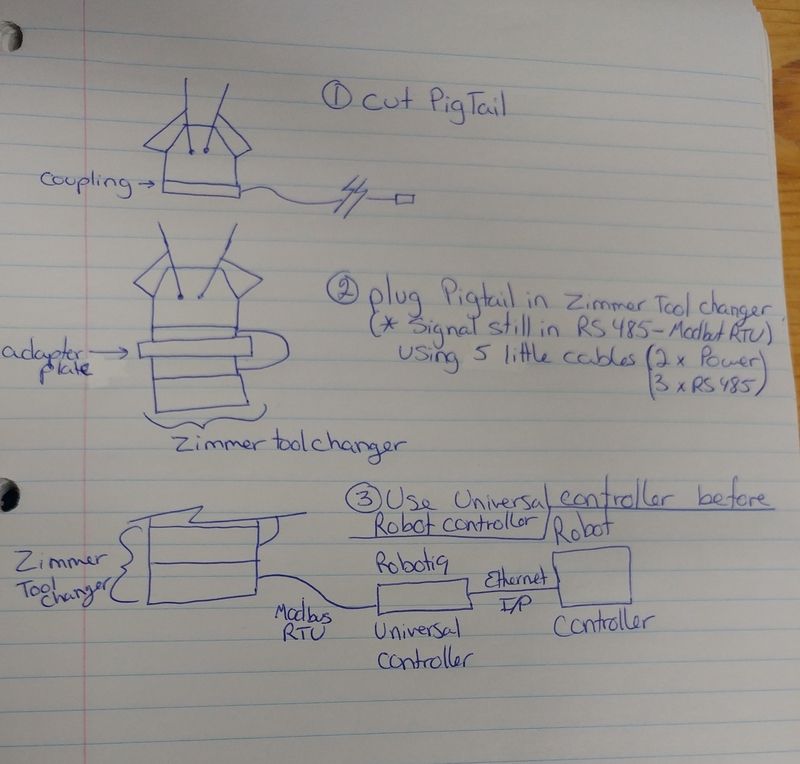 I have been working on an integration of the 2 finger gripper with the Zimmer tool changer with Ethernet I/P. So basically, for the bolt pattern of the Zimmer tool changer, you'll need an adapter plate custom as we don't have it as a standard yet. Also, the gripper communicates in Modbus RTU over RS485 so you'll need the Robotiq Universal controller to convert it in EtherNet IP. Then, you'll need to connect a Robotiq device cable from the Zimmer Tool changer and to the Robotiq Universal Controller to convert the signal in EtherNet IP. After, you'll use another cable from the Robotiq controller to the robot controller. So what you are saying is just cut the cable to the gripper and solder it to the energy elements. Side note: For UR you don't need the controller or the adapter plate. @gerenga you would need to route all 5 wires through the energy elements, so you need one of their option with 5 or more contact. Normally all of them are perfectly fine with 24V DC and 1 A we need.